TradingView is an online analytical tool for traders which enables to monitor the prices of any kind of assets in real time. Besides using hundreds of built in indicators, users can create their own signals and share with the community as well using its social platform features. TradingView has been developed by a group of innovative developers and traders who already had the experience of building trading software. They share a common vision that trading technology should be easy, powerful and accessible to everyone. When TradingView was built, the creators were taking advantages of the latest technological advancement including cloud computing and browser languages to bring interactive charts through any browser to anyone in the world. At the same time, TradingView has also built a social community for traders to interact and learn from each other during sharing ideas and work in order to improve their skills. 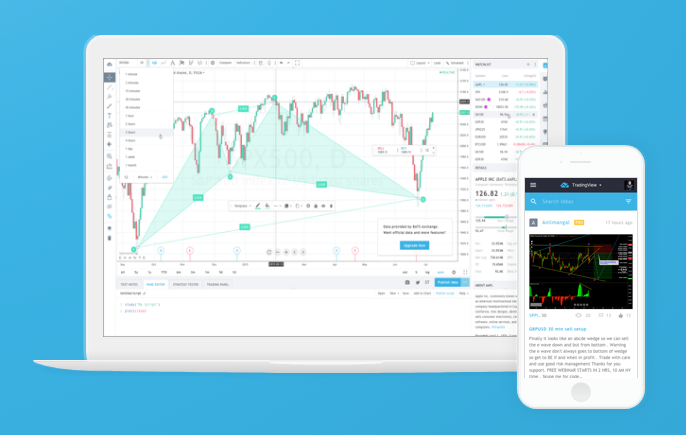 TradingView is a full trading platform built in a web browser. One of the co-founders of TradingView is Stan Bokov who has founded TradingView in 2011. He has gathered in-depth knowledge and experience of building interactive trading chart software during the past 10 years. The rest of the team also have trading or programming experience who have built TradingView into a truly global platform. 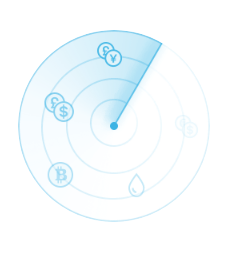 TradingView is an advanced financial visualization platform built in a website format. No need to download programs, you can access the charts and tools from any browser and any devices. The iOS application enables Apple users to have a complete experience with TradingView. The social network behind TradingView is beneficial for both traders and investors. Users can discuss ideas and trends from all over the world. The platform is suitable for both beginners and advanced traders due to the complex charting tool available for the more advanced plans. TradingView is fed by a professional commercial data feed, with direct access to stocks, futures, all major indices, Forex and CFDs. There is a wide range of cryptocurrency portfolio available at TradingView to screen and analyze. Bitcoin, Ethereum, Zcash, Monero, Dash and many more all available. The prices are feeding from all major cryptocurrency exchanges and available both in terms of fiat quotes like USD and EUR and both in terms of prices against BTC. Volume data and historical performances are also included in the analytical tools. TradingView offers alerts for immediate notifications to be able to follow the market even if you are not looking at the screen all day long. Alers like, “Alert me if Apple drops below $400, or goes outside the Bollinger Bands channel” are just examples of the customization you can build on the site. Visual popups, audio signals, SMS text messages and email alerts ensure you are always on the top of your investment. All of the alerts run on powerful and backed-up servers, so you’ll always get notified when something happens and will never miss anything on the market. TradingView has more than a hundred pre-built analytical tool, indicator and trading concept. But if that is not enough, you can browse from the user-built analytical tools from the public library. 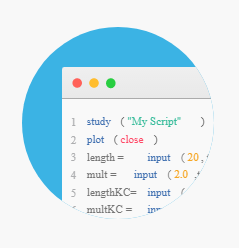 The Pine programming language allows anyone to create scripts to make sure the screening and analysis are as customizable as you want it to be. You can build new indicators from scratch or fine-tune existing tools. The ultimate goal of all analysis is to buy/sell securities and make profits. TradingView gives you all the tools to practice and become successful. But as trading always comes with risk, TradingView also offer risk management tools to monitor performance. The Simulated Trading section lets you play with fake money to test any trading idea without the risk of losing real money. You can practice with trading until you are comfortable enough to jump into real trading and place actual orders. It is also possible to open an account with a supported brokers and connect it directly to TradingView. Registration at TradingView is very easy. You just have to give a password and a user name and after the verification email arrives to the email address you have given you are ready to start. In terms of security, the site is secured by SSL connection, however, there is no possibility to enable two-factor authentication on the platform. Once you are logged in you can search for any ticker and add your preferred indicators to the interactive chart. You can publish your ideas in a form of a snapshot of the chart and share in on the internal social platform or to you own social networks. 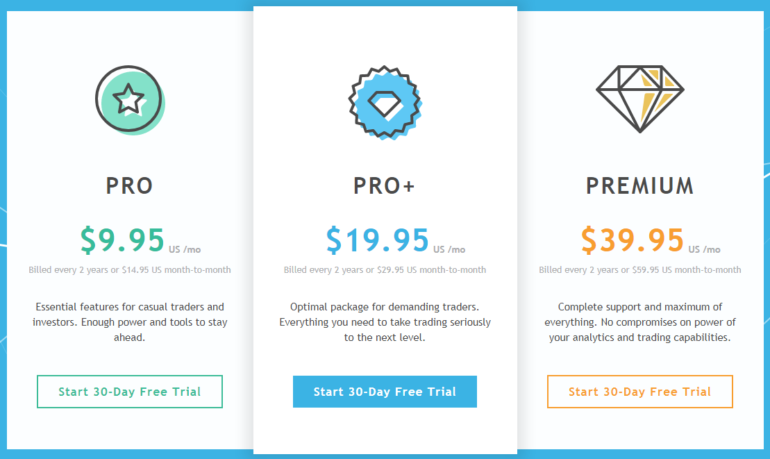 TradingView offers four different plans with gradually increasing features. TradingView also provides discounts on less frequent payment method, so within the same plan, you are charged less if you pay the bill for two years at once. The basic features can be used completely free of charge. The free plan includes one chart per user which can be used on a single device at the same time. On the chart, you can add up to three indicators. The next level upgrade is the Pro plan where for a fee of 10-15USD per month you can have two charts per layout with five indicators per chart which you can also save. It also enables 10 server-side alerts. For the Pro+ plan for a price of 20-30USD per month, you can have double about of charts and indicators up to ten saved chart layouts. The Pro+ plan also opens up the opportunity to create full custom charts. The Premium package cost 40-60USD per month, depending on the payment frequency chosen. This Premium plan is needed for professional traders, it consists 100 server-side alerts, 25 indicators per chart and you can save unlimited chart layouts on the platform. Premium clients can also enjoy high priority customer service with dedicated phone support personnel. All of the plans can be tried out for free for a 30 days trial period. TradingView is a great trading visualization tool for both newbies and advanced traders. The browser based analytical tools create a unique trading experience if combined together with the social community behind the platform. Users can share ideas, follow others, engage in discussions about the trades which can quickly improve anyone’s trading skills. The basic package is available for free, more advanced options are payable.